How often have you treasured a party invitation card as a souvenir? You may have done it on very few occasions or maybe never. The fact is invitation cards are pretty much useless once the party is over and make their way into the trash cans. Most hosts send out these cards only for information sake and with these being unimaginative in form and design. But there are a few people who try out creative party invitations making the perfect start to their events. Won’t you like to join this league? 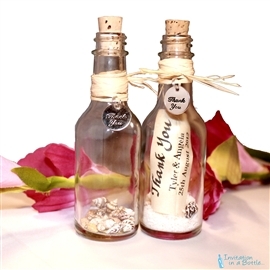 We help you with our awesome collection of creative invitation and thank you cards for your next party. Whether it’s your Wedding, Anniversary or Sweet 16 party it needs to be one to remember. You need to build it up carefully and it all starts with the perfect invitation cards. Creative party invitations can create the perfect mood and we have some of the most creative cards and gifts lined up for you. We don’t tweak the card alone but completely change the way it is packaged to immediately earn ‘wows’ from your guests. With our wide selection of invitation cards in a bottle you would create a strong impression in everyone’s mind and turn your party into a much awaited event. If you are hosting a corporate event to announce the launch of your new product or acquisition you want to make the headlines. And with our exclusive range of bottled corporate invitation cards you would be able to create storm within your business circle and also have the press take note of you. An event that creates an aura about your brand is all that you want and we would help you achieve it with our cards and other gift items. We know one size doesn’t fit all and hence we bring to you the widest selection of bottled invitation cards that come in different sizes, different kinds of bottles with their own kit and other add-ons. If you want budget cards in a bottle, we have an equally impressive range lined up for you. Set your party in motion with our invitation cards in a bottle. Rest assured they won’t make it to the trash can!